Best Molded Cranberry Relish – This molded cranberry relish always makes it on the menu for a perfect Thanksgiving dinner. 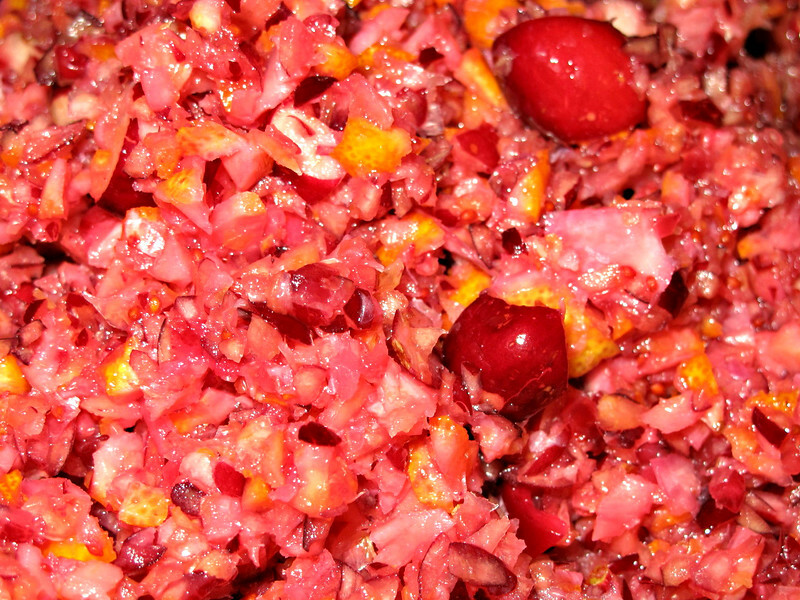 Not only is it an easy cranberry and orange relish recipe, it may become your favorite Thanksgiving holiday side dish. It’s not exactly this cook’s idea of a “relish” because it is quite sweet as a relish. Nor do I consider it a salad but some do. To me, it tastes more like Jello® dish full of yummy fruit to be enjoyed after all the savory flavors. It’s a clear gelatin version of whole berry cranberry sauce. 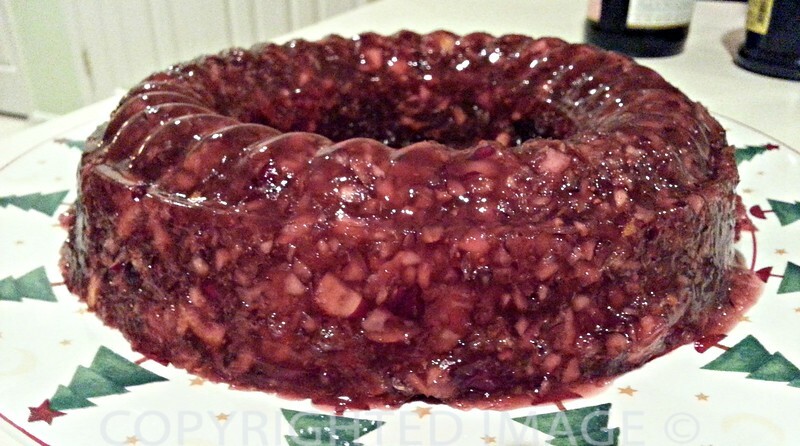 The Best Molded Cranberry Relish Ever! For Christmas 1972, I received a 768 page encyclopedic cookbook as a gift from my boss. Want to compare this one with other recipes? Along with the hefty book came a couple wishes from Dr. Schwartz. One was that I would, over the years, use it well and #2 that I would find at least one recipe which would become a family favorite. Dr. Schwartz, your wishes have come true. 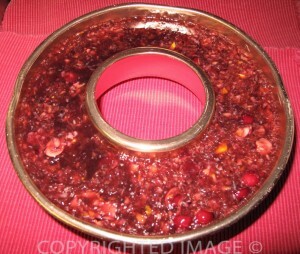 At Thanksgiving in ’73, I prepared what I think is the best molded cranberry relish in cranberry Jello®. It was thick with fresh chopped cranberries and oranges and has become a must have on our Thanksgiving table. That year, my sister and a friend made the trip to North Carolina to visit and nearly polished off the entire mold between them! In case you wonder… the molded cranberry relish tastes 10 x better than any canned or jarred version. These days even if dinner happens not to be at Great Grandma’s house, the relish better make the trip. It has become part of the must have selection of dishes. 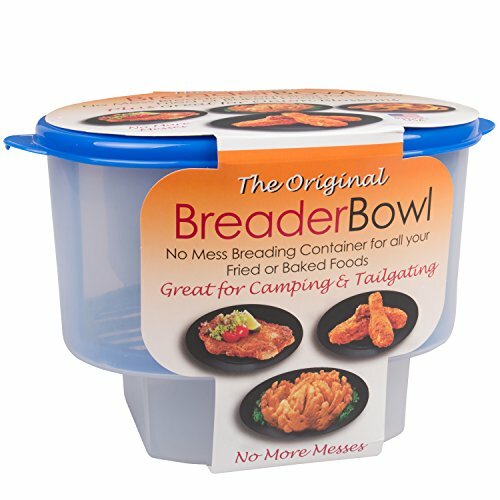 The cranberry relish can be prepared in individual fluted molds but you might as well use that large 1 1/2 quart ring mold. The vintage kind. It’s SO good, we serve it both as a salad or a dessert and of course, next to the turkey on Thanksgiving Day. Into Jello® molds and gelatin salads? I inherited my mother in law’s collection of original Mirro® coppertone molds along with all her favorite gelatin salad recipes! The first version of this molded cranberry relish barely made it to the Thanksgiving table. It was eaten as a Jello dessert – long before we sat down to dinner. Wash and sort the cranberries. Rinse but do not peel the oranges. Cut them into pieces and remove any seeds. Cut the lemon in several pieces. Chop all the fruit, using the metal blade of a food processor. Use several pulses rather than a continuous burst. You want the cranberry pieces not a mush of blended fruit suitable for granita. Turn into a bowl and add the sugar. Cover and chill in the fridge at least 1 hour to let flavors blend. I leave the mixture in the fridge overnight then add the resulting sugar syrup to the gelatin instead of water. Drain the cranberries, reserving as much syrup as possible in a 2 cup Pyrex measuring cup. To the syrup, add enough water to make 2 cups. In a large bowl, empty two 2 packages of raspberry gelatin – definitely cranberry gelatin if you can find it! You can also use 1 package of lemon flavored gelatin and 1 cherry, raspberry or cranberry gelatin. Add 2 cups of boiling water and stir until the gelatin is completely dissolved. Stir in the cranberry sugar syrup. Cool and chill just like Jello® until the mixture is a little thicker than unbeaten egg white. Add the cranberry relish, making sure it is evenly distributed throughout the gelatin. Spoon into the mold and chill in the refrigerator until firm. Cover with wrap until ready to use. Remove from mold onto a chilled platter and watch it disappear before the turkey is ready to serve! That’s why I make two. Ready to be unmolded, here is the relish, chilled to perfection in my mother in law’s Mirro® Jello® mold. Indeed, just as Mrs. Ressler added to her recipe below, we too eat it as a relish and a dessert. Enjoy! Combine the cranberries, marshmallows, and sugar. Mix well, toss, cover and chill overnight. Add apples, grapes, walnuts, and the salt. Turn into a serving bowl or spoon into individual lettuce cups. We serve it both as a salad or a dessert! We hope you’ll try what we consider to be a great recipe for the best cranberry relish! 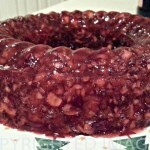 1 The Best Molded Cranberry Relish Ever!